Removes make-up, cleanses, soothes. Hypoallergenic - no perfume - no alcohol. 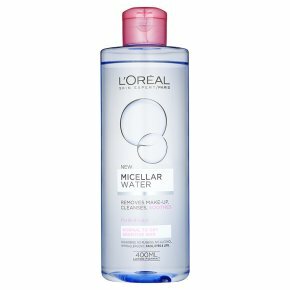 Tested under dermatological and opthalmological control.The L'Oreal Paris Laboratories have created a Micellar Water, made with purified water from an advanced purification process, and combined micelles that capture impurities, for effective cleansing which is gentle on sensitive skin. Removes make-up dissolves make-up from the face, eyes and lips in one gentle action, without rubbing or rinsing. Cleanses delicately captures impurities. Soothes: Calms skin and prevents irritation. 1. Morning and evening, apply a generous amount to a cotton pad 2. On dry skin, wipe pad all over the face, no need to rub or rinse. 3. Press gently to lashes, lids and lips and simply sweep away.